What would you do if you were a kitty looking for a new home? In Lavalino Finds his Forever Home, a kitty named Lavalino is enjoying his life on the streets of Italy. He lives in a beautiful garden next to a church. He has many friends who feed him fish and milk. But then, one day, the rains come and our cold kitty goes on a search to find a family to call his own. I am very excited to introduce my children’s book! I wrote Lavalino Finds His Forever Home to explore a theme that is important to children: how to persevere when you feel like you don’t belong,or are struggling with a life challenge. I was inspired by a true story that is very close to me. My sister, Vicki, found and adopted an adorable kitten in Italy. 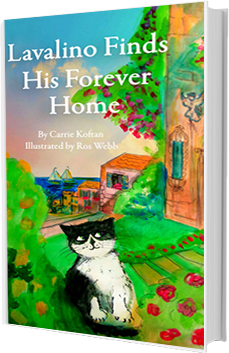 The real life Lavalino was a charming, clever cat with lots of character, and I had known for a long time that I wanted to create a series of kids books inspired by Lavalino’s adventures. The world is a much smaller place than when I was growing up, and I wanted to write a book to give kids a fun, yet meaningful way to learn about interesting places and people. As an extra bonus, my book allows teachers and parents to work on some key terms in another language in a fun way. My experience as a teacher has helped me draw on an understanding of human development and how kids learn. In my first book, it was important to me to tell a story that highlights the importance of persistence when met with a challenge, be it in learning or social situations. I’ve made Lavalino have a high sense of optimism in order to help children cultivate their own sense of optimism. If you are interested in having me come to do an “Author’s Day,” where I read my story and discuss literary elements, please contact me. I hope you love Lavalino as much as I do and that you follow along with us as Lavalino goes on further adventures in the “The Adventures of Lavalino” series. In addition to my children’s book, be on the lookout for my forthcoming book on autism: The Teacher’s Companion to Understanding Autism.